Sunday Sevens is a weekly blog series–started by Natalie at Threads and Bobbins–in which we post seven-ish photos from our week, stuff we did or made that doesn’t warrant its own post. It’s pretty fun and you should join us! I caught up on some things around the house this week that needed doing, like making another batch of lip balm. Recipe is here, though I used cocoa butter this time instead of kokum butter. Took an evening walk along the river and got a few pictures of the moon. And the sunset turning the grass gold. Unfortunately, I also discovered on that walk that Chiawana Park is rather serious about that whole “park closes at 9:00” business . . . I had to call my partner to come pick me up as the gate was locked with my car inside. MOVING RIGHT ALONG, I made one of our favorite meals this week. The recipe is here, but I use whatever vegetables I have on hand–and a lot more of them than the recipe calls for. I got the quilting done on the baby blanket, but it’s still here, as I then realized I didn’t have a card to send with it (I am fairly hopeless when it comes to this sort of thing). Will try to get it on the way to my niece tomorrow. I finished another bag for SCRAP and tried out yet another method for putting zippers in bags. I really like the fabric combination here, and I think making these patchwork bags has helped me to get better at figuring out what fabrics work together. Got my partner to come out with me for another walk on Saturday evening. The temp was 102F, but it was pretty comfortable walking along the river. Lots to do this coming week, including finishing a bag for a friend. Have a great week, everybody, and enjoy August while it’s here. Sunday Sevens is a weekly blog series in which we post sevenish pictures of the events of our week. Natalie at Threads and Bobbins got it started. Feel free to join us! The ongoing heat here means I’ve been spending WAY too much time cooped up at home. The downside of that is no outdoorsy photos, but the upside is that lots of home projects and crafts happened this week. I have apparently caught the organizing bug BIG TIME and went ahead and measured and sorted out the rest of my fabric. I guess it must have been bothering me more than I realized? Or something? Because otherwise I have no explanation for this. I even cut some selvages off of the leftover scraps for a future selvage project. Of course, the inevitable result was that I came up with another project idea. I have a ton of this cotton with leaves and ladybugs/ladybirds on it and decided to make a simple woven tee with it. 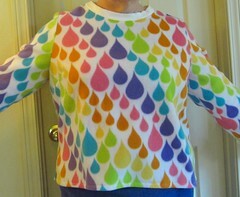 I’ve been wearing my lovely cotton me-made blouses non-stop recently, so maybe I could use another . . . . Some more blocks got done on my scrap quilt this week; that’s three months worth done now. W00T! The next color is purple, MY ONE TRUE LOVE. I’ve also finally gotten started on embroidering the first block for my Cozy Afternoon Quilt. I’m also happy to report that the cats have settled back into their little routines after Pooh’s Not-Very-Excellent Medical Adventure. Pooh’s back to his grueling napping schedule (rather than constantly following me around, as he was doing for the week after his surgery) and Shelby’s decided she still loves her big brother and has stopped hissing at him. We all spent a quiet Independence Day at home with our respective hobbies: me quilting, the cats napping, and my honey building up his new frame into a bike. We had a nice dinner of barbecued burgers, potato salad, and grilled marinated vegetables. If you have pots of herbs growing on your windowsill, this is a great way to use them; when I make it, I increase the herbs and cut the oil to 1/4 cup. The week to come should see less crafting and more outdoorsy-ness (yes, it is totally a word). My mother and sister will be in Oregon, so I’ll be doing house- and pet-sitting duties for them, and then my partner and I are headed to Montana for our second camping trip! Have an excellent week, everybody! Hello again! Busy week here, and a productive one, too, so I felt good about it. Summer is definitely here (near 100F today! ), so time to switch to summer main-dish salads. I initially tried this recipe because I couldn’t imagine how the flavors would work together, but they totally do. It’s one of our favorites. This time I used spinach, carrot, red onion, grapes, and chopped apple. This is Bateman Island from Tuesday’s walk. 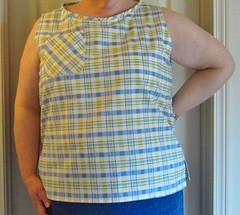 On Wednesday, I finished up a yet-to-be-blogged blouse (the version on the bottom right here). Not quite sure about this one. Thursday’s walk was to Clover Island. The big thing casting the shadow on the left is the lighthouse, but I liked this angle better than yet another boring lighthouse shot. I’ve been trying not to take on too many projects at once, but I just couldn’t get this scrap quilt out of my head. I kept going back and looking at it and thinking how pretty it would be if made with my scraps . . . I finally just decided to do it. I did, however, decide to get serious about organizing my scraps so that I can ACTUALLY FIND THINGS. So I went through my scrap drawers and sorted them out and they look SO LOVELY now. This coming week, I’m planning more organizing, more walking, and more sewing. Much sewing–and thinking about sewing–happened here this week. I’ve been playing around with quilt blocks made from my new Mary Engelbreit fabrics. It’s been forever since I pieced quilt blocks, so I needed the practice. No idea what these will be used for yet. Working on replacing the zipper in this orange cycling jersey I made for my honey a couple of years ago. Note to self: DO NOT SEW ZIPPERS SO SECURELY. Settled on a plan for the barkcloth I got the other day: (yet another) travel bag, a tote bag for short trips. 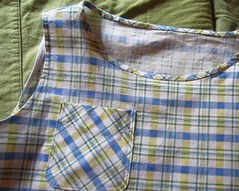 I will enlarge this pattern a few inches and maybe add some pockets to it. If I can be bothered, that is. Discovered the solution to the “too many leftovers” problem this week: put leftovers on grilled pizza and serve ’em again. This one had grilled marinated chicken and veg from the previous night’s dinner; I just added some green onion and mozzarella for the pizza. On Friday, I went over to SCRAP Tri-Cities to volunteer and–what do ya know–they had more Mary Engelbreit fabric. SEWING THEMED Mary Engelbreit fabric. I was, of course, helpless to resist. I’m setting these aside for the moment since, at last count, I had 5 projects planned (plus 3 more I’m considering: summer PJs, another BOM, and a scrappy quilt) And I need to finish the jersey zipper and the blouse I’m making before I get distracted by shiny objects again. On Saturday evening, my partner and I went out for a walk. Temp was still close to 90F–summer has arrived here!–but there was a steady breeze off the water and it was very comfortable. This is Wade Park in Pasco, looking across the Columbia River toward Kennewick. Have an excellent week, everybody, and may the sewing mojo be with you. ETA: Corrected date in title. CALENDARS HOW DO THEY WORK? Sunday Sevens is a weekly blog series in which we share seven-ish pics from our week and chat about what we’ve been up to. Thanks, Natalie, for getting it started! I had a busy week here with lots of getting out in the warm weather. Well earned, I’d say. They started 6:00 a.m. Saturday and finished about 8:00 p.m. Sunday, with only a 2-3 hour nap on Saturday night. Quite a heroic (if nutty) feat. Wednesday’s dinner was Indian food: Vegetable Biryani Rice and Hamburger Kebabs from Madhur Jaffrey’s “Quick and Easy Indian Cooking.” Another cleaning-out-the-produce-bin-before-I-go-to-the-grocery meal. We have a brand-new creative reuse center here: SCRAP Tri-Cities! They just opened on Friday and you know I had to be there. It’s not like I can be expected to resist something that combines my love of crafts AND my love for a screamin’ deal. I got some GREAT stuff, and all kinds of ideas are percolating in my head on how to use it. The Mary Engelbreit fabric in the last pic is going to be combined with some stuff in the stash to become a quilt. And the fabric with the big orange flowers in the first pic–which I think is possibly-vintage barkcloth–is about to embark on its new life as a tote bag, once I decide on the right pattern for it. And one more nature shot, this time from this weekend’s trip to Lewis and Clark Trail State Park, outside Waitsburg, WA. What a gorgeous place, on yet another river, the Touchet. Be sure to check out Flickr for lots more pictures from that trip. Have a great week, everybody, and get outside if you can. Sunday Sevens is a weekly blog series in which we post seven-or-so pictures from our week. See Natalie at Threads and Bobbins for more info. Hoo boy, it has been a week of ups and downs here! Last week, I got the exciting news that I won this adorable bag from La Cartera! Monday, I received the bag and it is BEAUTIFUL! More pics to come–I took it on an adventure this weekend. Partner: I’m going to pop ’round the doctor’s this morning about the [SCARY SYMPTOM] I’m having and feeling weird. I told you about that, didn’t I? Me: When you said you felt weird earlier, what did you mean by that? Partner: Oh, I just meant I’m having [SUPER SCARY SYMPTOM]. I totally get why people make food when somebody is sick. Because 90% of diagnosing and treating an illness is actually sitting around waiting–for tests, test results, doctors, medications, whatever–so making food gives you something constructive to do (other than sitting around fretting) and it helps to nourish and strengthen the sick person (and all the people sitting around fretting with them). He’s okay for the moment–both SCARY SYMPTOMS are almost gone–and more tests and visits to specialists are in the works. For this week’s walk with my mother, we went to Zintel Canyon Park in Kennewick. This was absolutely essential, as they’ve got a team of 200 goats there working on the landscaping. Most of them seemed to be on their break when we were there. I put the kale in my colander, then pour my hot pasta over it to soften the greens a little. Be warned if you make this recipe that it makes a TON. This weekend, my partner and I are helping run a bike ride–riders choose a 400k route or a 600k one. Beautiful ride through grasslands and wheat fields in mild weather, though the tailwind they had Saturday morning turned into a headwind in the afternoon and made these hills outside Starbuck pretty challenging. Have a great week, everybody, and be sure to care for the people you love in whatever way you can. I was SO tired of the exercise DVD I’ve been using and wanted something with more upper-body work, so I tried this one a couple of times this week. Am I the only one who feels like a moron when she tries to do aerobics? I get my arms and legs all tangled up and can’t figure out how to get from one movement to another . . . it’s not pretty. I’m getting better each time I do it, though, and was surprised to find I had more upper-body strength than I thought–was able to do the workout with 7-pound weights with minimal pain in the days afterward. Made a lovely pizza with the andouille sausage I bought in Olympia. I might try this recipe next time with fresh tomato instead of roasted. Yes, my pizzas are always amoeba-shaped. Another walk with my mother this week along the banks of the Columbia River. I’ve been slacking off on using sunscreen–must get better at that! Bonus picture because COLOR–brand new lime green foliage against that blue, blue sky. Grilled jerk chicken sandwiches using this marinade. I liked the BBQ sauce in the recipe, but found it to be too much with the spicy chicken; I’m saving it for marinating more chicken this coming week. Tucks and facing done in my blouse fronts, darts done in the back. Man, if you like marking fabric, B6026 is your pattern. I’m considering using another pattern with the “Yellow Submarine” fabric, just because I’m not sure it’s worth it going through the hassle to make all those tucks on such a wild fabric. More sewing in the works today, as well as roasting a chicken for dinner. Have a fabulous, colorful week, everybody. It felt like a week full of transitions and adjustments here, with travel plans being reconsidered, and spring giving way to summer (maybe). On Sunday, I had to do an emergency repair on a certain bear’s most favoritest toy. Obviously the most important project of the week. I spent what felt like forever basting lines in shifty cotton fabric for pleats. Many, many lines. I found this book that I had forgotten about and studied up a bit. Partner helped with some diagrams and helpful advice. And loaned me his camera! Must get out for a walk this week and try it out. We had every type of weather except snow this week–a thunderstorm, frost, high winds with blowing dust, record high temperatures . . . . I hauled out my bins of summer clothing and I’m trying to figure out what to do about it; can I store away my fleece? should I unpack my tank tops? While I work on that problem, I put away our comforter and got the spring linens on the bed . . .
. . . and switched to my summer purse. I took my mother out for another walk on Thursday, and we literally walked to the end of the road. I had lots of the cooking mojo this week and was really happy with what I made (with the result that I ate too much, but there’s no need to get into that). My plan for today–in addition to cooking another fabulous dinner–is to get the purple blouse done or close to it. In addition to all the sewing projects I wrote about yesterday, I’ve had a request for a custom cycling cap, so there’s plenty of crafting to be done. Have a creative week, everybody! Where has the week gone? I feel like I spent the entire seven days doing boring, unphotographable (if that wasn’t a word before, it is now) things like hauling my mother to medical appointments. I did finish my sister’s birthday present on time (barely) and I completed the fleece jacket UFO, though, so some productivity did happen in between all the running around. Sunday afternoon, my honey and I got back from our weekend in Seattle. I guess it had been a while since we’d spent two nights away from the cats, as Sunday evening and all of Monday were spent with them following me around and yelling at me, resulting in massive cuddling sessions. It was TOTAL PANIC because their people were gone FOR LIKE YEARS and even though they had plenty of food and water, THEY ALMOST DIED. Monday afternoon they finally settled down into their usual catatonia. Much contemplation of fabric and rifling through patterns happened this week as I played around with spring sewing ideas and did some reading on burn tests and tissue fitting. I spent Saturday helping out with the 300k (180 mile) ride my partner organized in eastern Oregon. I expected the experience to be rather tedious–hours spent sitting in the car waiting for riders to show up so I can sign their cards? Um, woot?–but it was actually a pretty fun day. The ride started at 6:00 in Hermiston, and I got to the first control point at the Pendleton Safeway at 8:00 to meet them. The whole group of 6 riders showed up at 8:45, then headed out again. I had a few hours to kill before the next control, so I went to the local fabric shop, Thimbles, Fabric ‘n’ More, to look for fabric for my next gift project. They didn’t have what I needed for the gift, but I did find a little something for me in their nice selection of quilting cotton and vast notions area. Then I went next door to the park and took a long walk along the river. I was able to finish up the hand sewing on my fleece jacket while waiting in Hermiston for the riders to show up. Then they were off again, and I headed home. Have a great week, everybody, and I hope you’re able to do something fun for yourself this week.